This beautiful senior girl is Lilly. She is a 10 year old Pit Bull Terrier mix. Animal shelter staff and volunteers report that Lilly is a sweet soul. She loves to go for walks, play with balls and toys, plus she's smart and eager to please. Be sure to watch Lilly's adoption video. Note: it was filmed well over a year ago. 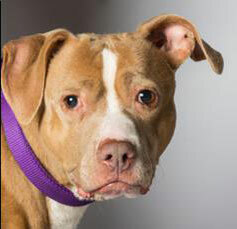 Lilly has been waiting for a home for a very long time. Hi there, I'm Lilly! I am such a simple, sweet soul, just longing for the love of a forever family. I promise not to ask for much...just a quiet life with you by my side would mean the world to me. I try so hard not to lose hope or feel down that I'm homeless once again. But I'm one of those dogs who never seem to be able to catch a break in life. I know that happens with people too, so I don't mean to complain. I try my best to look forward and have faith that this is where I am meant to be in order to finally find you. 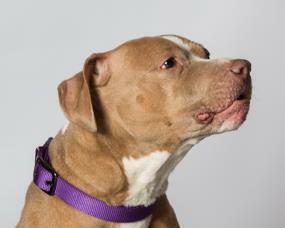 I'm a laidback, easygoing, senior dog, weighing in at 48 pounds of solid muscle and love. I'm already housebroken, but please be patient with me when we get home, as I get used to my new routine with you. I have been through a lot in my life. I lost one home because my breed wasn't welcome in the city I lived in. I spent months at Wayside, searching for a new family. And I was eventually adopted, but my owner couldn't care for me. It was a stressful time for all of us and I was treated harshly in that home. That's why I flinch at times when you approach me now. I'm a loyal and loving dog, so this time around I am looking for a kind and gentle person to share my life with. I'm sort of a rock star here at Wayside and I'm proud to say that the volunteers love me! They make me feel so special and cared for. I love to go out for walks and I enjoy my exercise time. It helps me to stay happy and healthy. I do pull on my leash sometimes, but a harness works just great for me. And I love to play with balls and toys. I'm smart and eager to please, so I'm always open to learning new things. Please use positive reinforcement with me, by praising me when I am a good girl, because I respond very well to that. I'm sort of an independent gal, so I promise not to bother you for constant attention. But when you want me, just call my name and I will be there! I'm affectionate and cuddly and super sweet. I love to be by your side, curled up next to you on the couch or just in the same room with you. I just like to know that you're there. I'm chilled out and relaxed in a home or car or fenced in yard. Since I'm looking for a quiet and calm home without a lot going on, I think I'll be happiest in a home without kids under the age of at least 5. And I can be picky about my dog friends, but I tend to do best with other low energy dogs. Or I'd love to be your only dog as well! Why don't you just plan to bring the whole family out to meet me and we'll see how we all get along. I'm not sure why finding my forever family has been so elusive for me. I'm a wonderful dog with so much to offer. I will make a loyal, devoted companion to you for the rest of my life. I'd love to make up for lost time and find the perfect new home where we can just hang out and appreciate each other. I don't need adventure or much to do...I just need you. I hope you need me too! 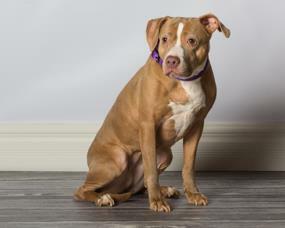 For more information about Lilly, contact Wayside Waifs at 816-761-8151. She sounds so sweet! It breaks my heart that she's had such a tough life. I hope she can be in a happy home very soon. I want to adopt every single one of these sweet pups. I am praying for her forever family. Oh, sweet baby. I hope she gets her forever home soon! I was at the shelter today and a senior dog who'd been there quite some time got adopted during our Seniors for Seniors program. Yay! Poor thing! I hope her real forever and ever people show up soon! What a sweetheart! Paws crossed for her. I think something is up with the linky tools :( I can't get it to come up on my blog and it looks like it isn't working on yours for last week either. Figures!